Today is Ben’s and my anniversary, celebrating two years of adventures together. We decided to go to the Science Museum here in London today to check out a special exhibition they were hosting called “ZombieLab”, followed by a special screening of the new film Warm Bodies. While the exhibition turned out to be a bit of a bust, the movie was a lot better than what we had expected. We laughed a ton! 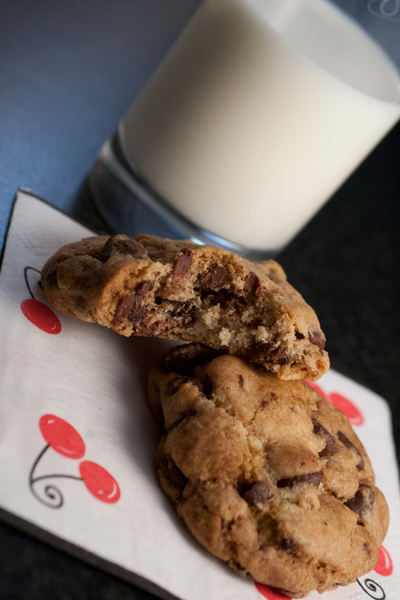 Knowing I wouldn’t have a lot of time to bake this weekend, I decided to make something simple: chocolate chip cookies. 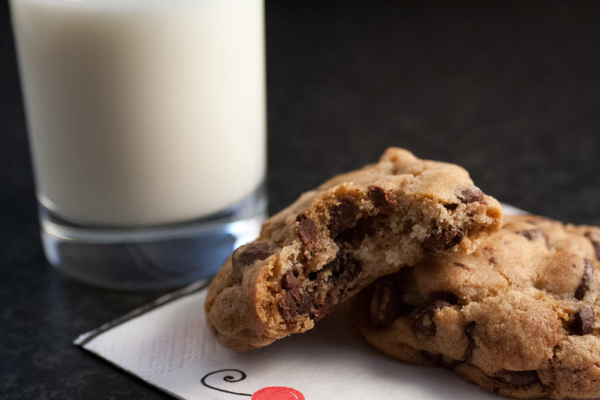 Now, normally when it comes to this classic treat, I stick to the Toll House original recipe. It’s what my mom always made, it’s what I’ve always made and it’s never failed us. Or anyone for that matter. But a few of the food blogs I read all posted the same recipe for chocolate chip cookies. 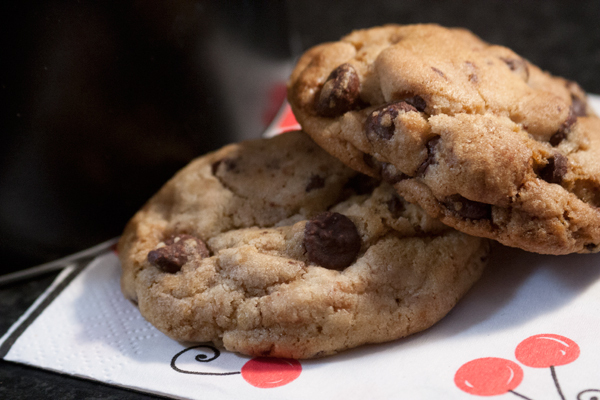 And a quick Google search reveals that just about every food blog completely exploded over these cookies: the New York Times chocolate chip cookie recipe. After a quick read of the recipe, it seemed like a good idea. Mix the dough and let chill for 24 hours – meaning that I would have cookie dough ready and waiting for when we got home tonight so that we could have some fresh, warm cookies and milk. I must say, these cookies are good. They puff up quite nicely, and the sea salt gives them a bit more flavor that the Toll House recipe. However, they aren’t as soft as the usual ones and are quite dense. So, while delicious, I may just stick to my old standby next time. Try this recipe for yourself and let me know which recipe you prefer! 1. Sift together the two flours, baking soda, baking powder, and salt into a large bowl and set aside. 2. In the bowl of your mixer, cream the butter and sugars until light and fluffy, about 5 minutes. Add the eggs, one at a time, mixing well after each addition. Stir in the vanilla. Reduce the speed to low, add dry ingredients and mix until just combined, 5 to 10 seconds. Drop the chocolate pieces in and incorporate them. Press plastic wrap against the dough and refrigerate for 24-36 hours. 3. When ready to bake, preheat the oven to 350°F (175°C). Line a baking sheet with baking paper and set aside. 4. Scoop the dough into balls that are slightly larger than a golf ball and place them on your baking sheet. Sprinkle them lightly with sea salt and bake until golden brown and soft, 18 to 20 minutes. Transfer sheet to a wire rack for 10 minutes, then slip cookies onto another rack to cool a bit more.